Tiny. Light. 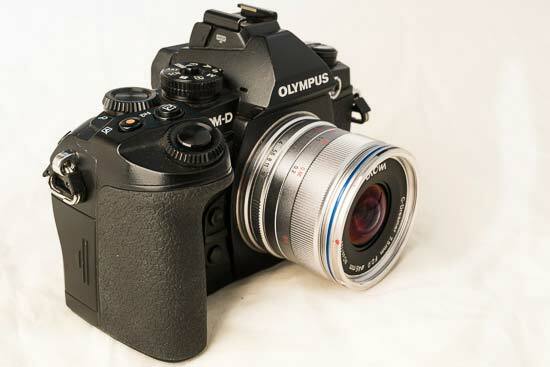 The Laowa 7.5mm f/2 is an ultra-wide, manual focus lens for Micro Four Thirds (M43), making it compatible with both Olympus and Panasonic M43 cameras. Billed as the widest rectilinear f/2 lens for M43 cameras, its equivalent 15mm focal length is ideal for landscape and astrophotography. 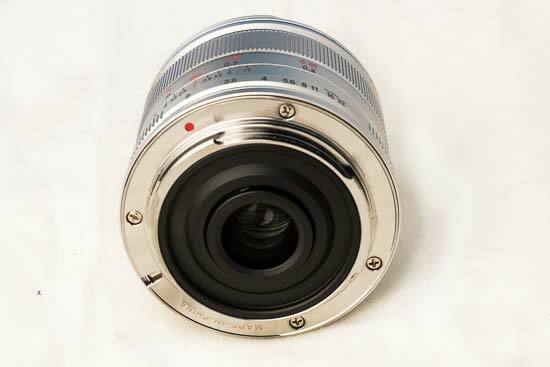 This is not a Fish-Eye lens, like the Samyang 7.5mm f/3.5 lens which offers a 180° field of view. No, the Laowa lens features a 110° field of view. Being rectilinear, it is designed to reduce distortion so straight lines appear straight in the final image. The lens weighs a mere 170g. Yet, if we didn’t think 170g was light enough already, Laowa has an even lighter 150g version, marketed for use with a drone. 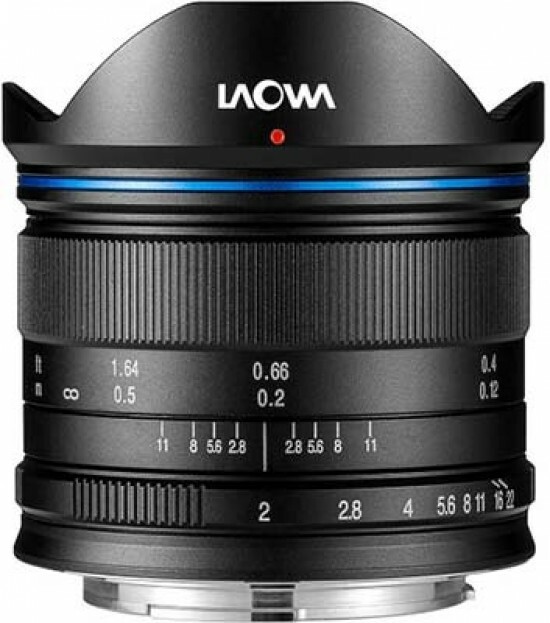 Having seen the first prototypes at Photokina 2016, the Laowa 7.5mm f/2 lens is now available for purchase via Laowa’s UK website. 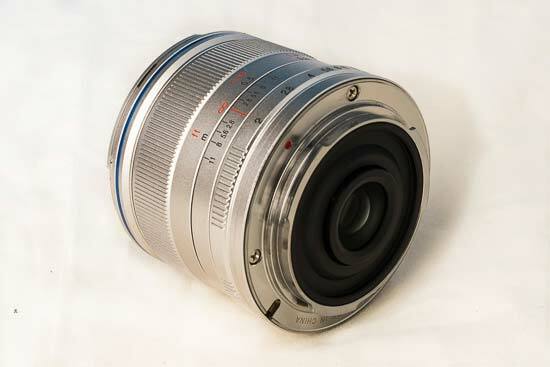 Available in silver (original) and black, the Laowa 7.5mm f/2 lens costs £499 (inc VAT). 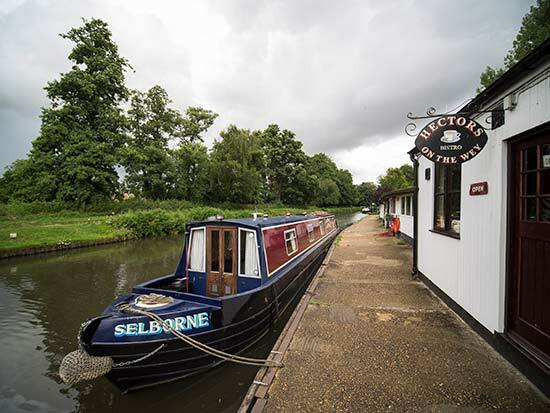 The Lite version is identical in every way save for the material weight and it costs £519 (inc VAT). First things first. 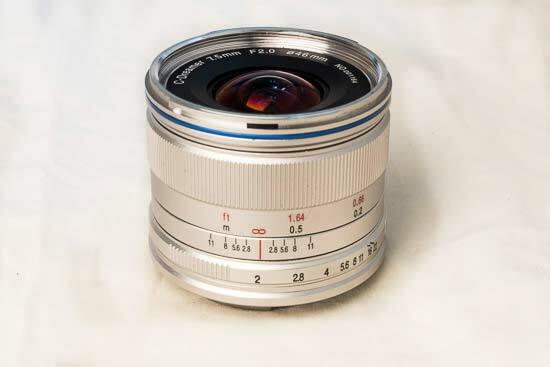 The Laowa 7.5mm f/2 lens is manual focus only and features a fully mechanical mount. It does not include electronic contacts that would otherwise provide aperture and focal length indexing (metadata). If you love to know what aperture a picture was taken at, you’ll have to start note taking. Being a fixed lens, the focal length of pictures is rather obvious, so the missing focal length metadata is not a problem. Metering is limited to the stop-down method. This is a lens for those that are able and/ or willing to take control into their own hands. 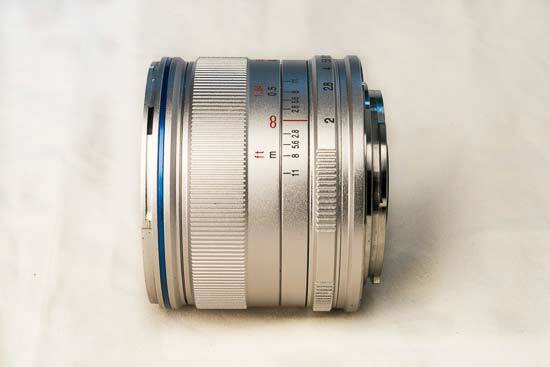 The Laowa 7.5mm f/2 lens truly demonstrates the benefit of the M43 format. 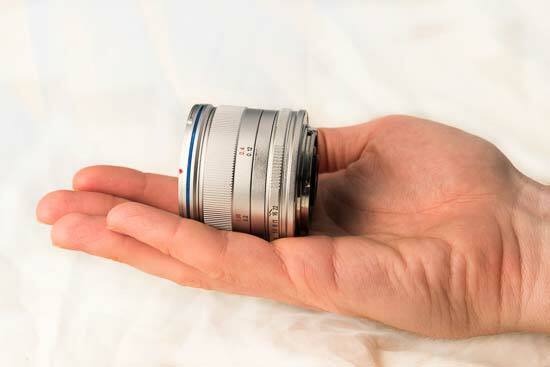 It’s both tiny and light, at 50mm in length and weighing 170g. 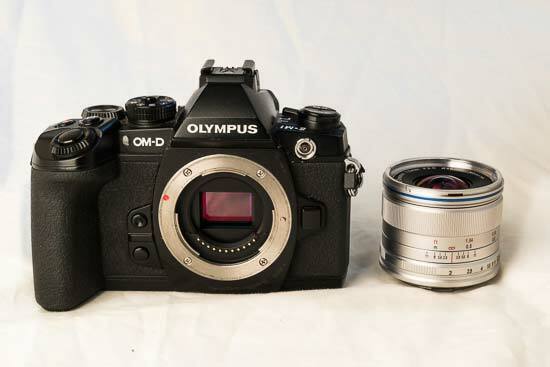 You could expect an equivalent full-frame lens to be at least 3x the size and weight. 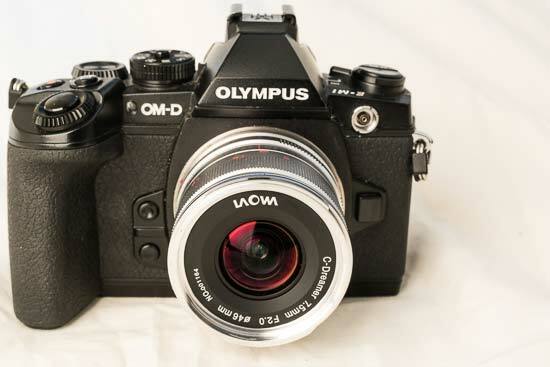 Some of the closest M43 lens competition is more than twice the size and weight - more on this later. Attaching the lens cap adds another 15mm - you’ll need it to reduce the chances of lens flare on account of the wide angle of the lens. 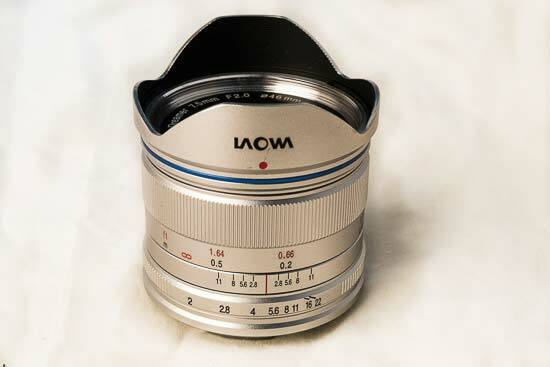 Unusually for a lens as wide as this, the Laowa directly accepts threaded filters, that can be attached to its 46mm filter thread.  Most other ultra-wide angle lenses do not include a filter thread, because the bulbous front lens element protrudes beyond where the lens filter thread would be. In such cases, an expensive specialist filter holder kit is needed to accommodate filters for those that wish to use them. Image makers wanting to use the Laowa lens with lens filters will save plenty of cash, because singular threaded filters cost much less than a new filter holder/ square filter kit. Those that benefit in particular are likely to be filmmakers making the most of the wide f/2 aperture, plus landscape photographers that attach neutral density (ND) and circular polariser filters. We haven’t used the lens with threaded filters yet. Build quality is pretty solid and the focus ring can be rotated smoothly by gripping any of the front half of the lens barrel. The aperture stops are clicked, while the aperture ring is right up against the camera body and is a little trickier to get a hold of. We found having the thumb on the underside of the lens to be a more comfortable way of rotating the aperture ring. On that note, there are further downsides to the diminutive size of the lens. One is that the lens cap and lens hood can both be a bit fiddly to add and remove. Another is that the physical distance between aperture stops incrementally reduces until it’s all bit a minor touch to stop down the aperture. Once you move between f/8 to f/22 it can be hard to keep track of which aperture is selected without a visual check, especially given the aperture is not displayed on the camera. With the lens being so wide, there are some practical implications regarding focusing. Ensuring a sharp focus has been acquired is tricky using the non-magnified LCD screen display and even the electronic viewfinder. 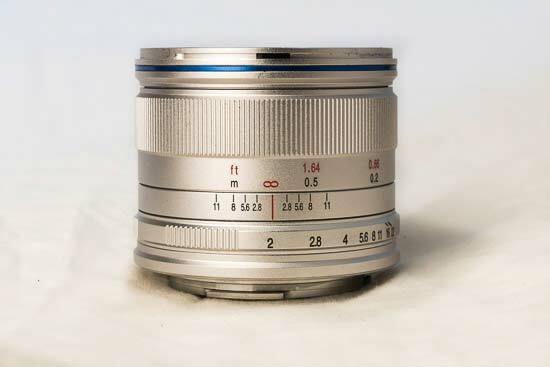 An estimate can be made using the focus distance scale indicator on the lens barrel, but the margins for error in sharp focusing using the wide apertures are narrow. 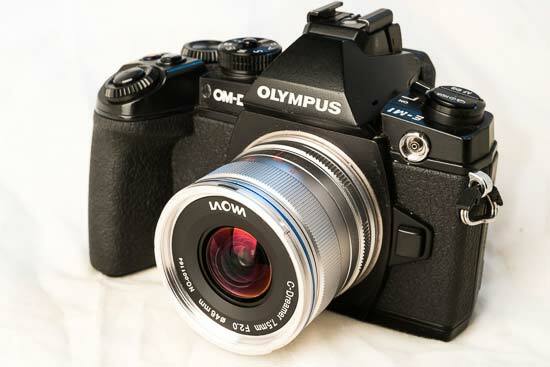 Testing the Laowa 7.5mm f/2 lens with the Olympus OM-D E-M1, we found manual focus assist to be the most useful tool for acquiring a sharp focus. 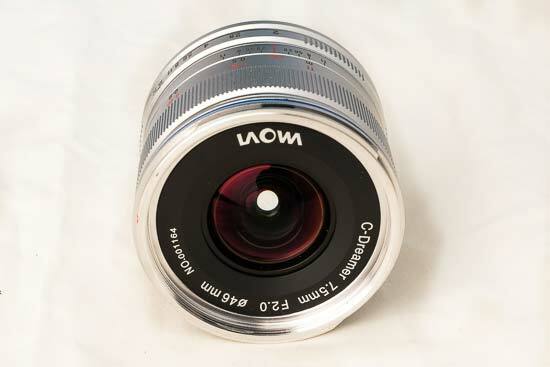 Most cameras with live view display offer manual focus assist, typically with a 10x magnification. In addition, it can be worthwhile checking the focus post capture in image playback. This is not a lens to be used in a rush. We haven’t used the lens with a drone, though for smooth videos a stabilised drone and/ or a camera with in-body-image-stabilisation would be a must - the Laowa lens of course does not feature optical stabilisation. 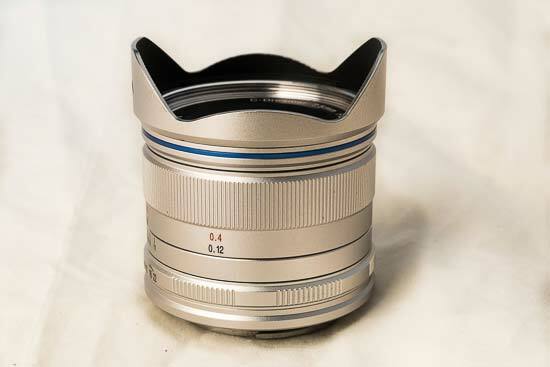 The lens does not come with a case, so users will have to source their own protection for the lens when it is not in use. 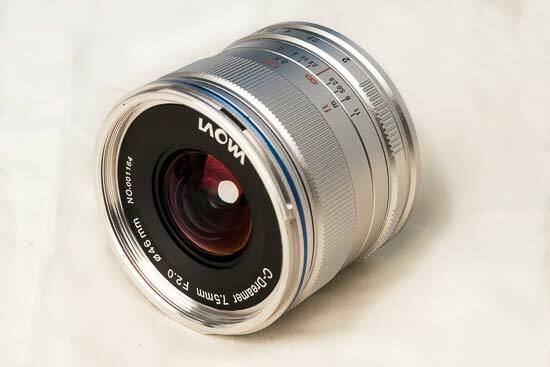 The 7.5mm focal length (15mm full-frame equivalent) gives an angle of view of 110° on a M43 sensor. 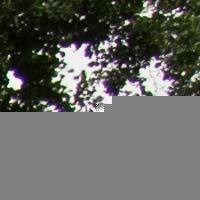 The appearance of chromatic aberrations is minimised rather well. 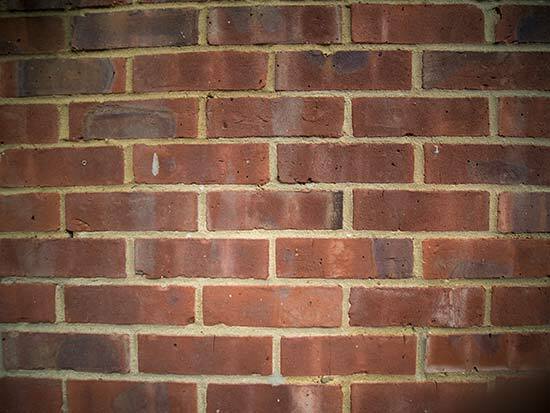 We have seen minor green and minor magenta fringing around high contrast edges in some test shots, but these distortions can be removed with ease using editing software. Using Adobe Lightroom CC, worst-case fringing disappears with the appropriate manual correction amount set to 3. Light fall-off (vignetting) is noticeable wide open at f/2, though this is to be expected for such a wide-angle lens and again can be manually corrected in software such as Lightroom (though the lens profile will not be available). 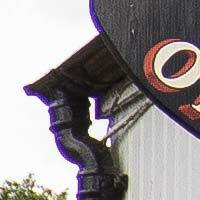 Stop down to f/4 and vignetting is less prominent and all but gone by f/8. When making the most of the wide apertures for astrophotography, lens corrections for vignetting need to be applied. You’ll see that in our pictures - that have not been corrected for lens distortions - the appearance of barrel distortion is controlled rather well for such a wide angle lens. It’s not perfect, but it is acceptable. This is not officially a macro lens. With a 12cm / 0.40ft minimum focus distance, it is physically possible to get very close to subjects, though the wide field of view means a lot is still in the frame. 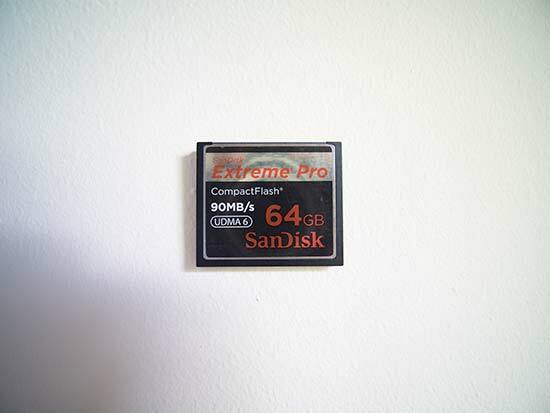 This uncropped image show how close you can get to a CF card.